A: Squelch cannot be changed, try changing the channel and sub-code channel to try and resolve the issue. A: With any type of wireless product, there is always the chance of some sort of interference. Try activating a Sub/Privacy Code to your channel. Press MENU to access your radio’s advanced functions. Additional presses of MENU will advance you through the menus until exiting to “Normal” operating mode. Press and hold MENU again. Press any key except CH▲ CH ▼ or VOL▲VOL▼ and wait 10 seconds until the unit returns to “Normal” mode. Sub Code Each of the channels 1-22 may have any one of the codes, OFF, or 1-121 selected. Code “OF” (OFF) indicates no Sub code selected and your radio can receive a signal regardless of the code settings of the transmitting radio. Press MENU to enter Menu mode. The subcode indicator flashes. Press CH▲ / CH▼ key to increase or decrease the code number displayed. You can also select “OF” (OFF) at this stage. Press MENU to exit Menu mode. Press any key other than CH ▲ / CH▼ or VOL ▲ / VOL▼ and the radio returns to Idle mode in 10 seconds. FRS – Family Radio Service — Channels designed for family recreational use only. You DO NOT need a license to operate on these channels. GMRS – General Mobile Radio Service — Channels also designed for family and recreational use but allow for a bit more communication distance than the FRS channels. These channels allow for the ability to use detachable antennas and repeater stations to lengthen the distance of communication. You WILL need a license to operate on these channels though it is not regularly policed. VOX (Voice Activated Transmit) — Feature on two-way radios that allow for you to use the radios handsfree. This feature is sound activated so all you do is speak and the radio will transmit for you. Privacy Codes — A feature that helps filter out the chatter from other users who might be using the same frequency. Common misperception is that the conversation is private when using this feature. IT IS NOT. Your conversations can still be heard by users who set their radio to not filter for a privacy code. PTT (press-to-transmit) — Button on the radio (and some headsets) that you press to transmit. Roger Beep — Tone that let’s the other two-way radio users know when you are done with your transmission. Keypad Lock — Locks your keypad to prevent unintended changes to your settings while being bumped around. Ni-Cad – (Nickel Cadmium) — Long life expectancy and rarely have issues in regards to over charging. Usually will last up to 3 years. NiMH – (Nickel Metal Hydride) — Usually lasts up to 2 years and have overcharging issues if proper charging practices are not used. Li-Ion – (Lithium Ion) — Life expectancy is based off of number of charging cycles (500, 1000, etc) once reached the battery will no longer work. Usually charges extremely fast and do not have issues with overcharging. ***Proper technique when using your radios is to allow the battery to completely deplete before recharging. If you do not, the battery will recall the partial charge and only charge up to that point the next time around. Noise Filtering Feature — Reduces unwanted noise by shutting off weak transmissions. Range Extender — Extends the range of your two-way radio by allowing for even weak transmissions to come through. Repeater Feature — Allows for the two-way radio to communicate through a local repeater which amplifies your radio signal and lengthens your communication range. Two-Way Radio — A two-way radio is a hand held device or transceiver can both transmit and receive voice communication. Broadcast Environment’s use receivers meaning one can receive voice but not transmit communications. 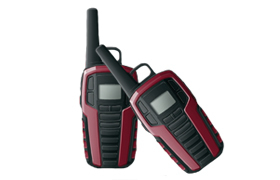 Other terms for Two-Way radios include; walkie-talkies, hand held radio or handie-talkies. The three types of Two-Way radios are; hand-held, mobile, and stationary or base. 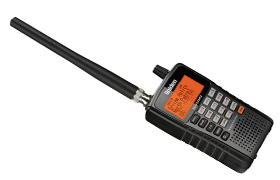 Hand held radios have .5 to 5 watts whilst LMR and base stations have up to 60 watts of power. Base Station — A Two-Way radio device which typically resides at one’s desk or in a control station. Base stations are located in a control center or hub used by; Airports, Police Stations, Hospitals, Taxi cab station, security company base, etc. Base stations help direct “traffic” of two way radio and Land Mobile Radio System users in the field. 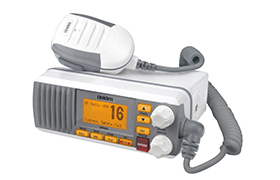 Land Mobile Radio System (LMRS) — Mobile radios are designed to be mounted in cars or boats for higher powered communication (communicating over longer distances) Mobile radios typically have 60 watts of power while professional hand held radios have only 4 watts of power. Mobile radios are typically used by emergency first responders, public works organizations, or companies with large vehicle fleets and numerous field personnel. Push To Talk (PTT) — A button, typically on the side of the radio or on the external headset, that when engaged activates the microphone for transmission. It is important to note that only one radio can transmit on any given radio channel at one time. Half-duplex — A system that only allows the transmission of a radio signal in one direction at a time. Meaning, only one person can speak and one (or more) people can listen at any given time. Most all Two-Way radios work in this fashion. Full-duplex — A communication system that allows both parties to speak and listen at the same time. This is done by using two different frequencies to establish communication back and forth. The most common use of this system is in telephone systems around the world. Push-To-Talk switches are not needed in this system. Repeater — A device that is installed at a fixed location and whose sole purpose is to receive a signal and then retransmit the same signal at a higher strength. Repeaters are used by institutions such as police departments and hospitals to transmit signals over a longer distance than the Two-Way Radio was previously capable of. Installing a repeater commonly used to eliminate a “Dead Spot” in a building or town. Voice-Operated Transmit (VOX) — A feature that detects when the user begins to speak and automatically turns on the transmitter, nullifying the PTT switch. VOX Mode is undesirable in noisy environments. UHF (Ultra-High Frequency) — UHF denotes a frequency range of electromagnetic waves between 300 MHz and 3,000 MHz (3 GHz). As UHF frequencies use a shorter wavelength they are generally used when working in and around buildings as the communication waves penetrate walls and steel structures best. The UHF frequency band has more available channels, so in more populated areas UHF is less likely to have interference from other two way radios. UHF works best for Churches, Medical Office, Retail Shops, Hotels, Casinos and similar environments. VHF (Very-High frequency) — VHF denotes frequency range from 30 MHz to 300 MHz. VHF signals travel low to the earth’s surface. In the country or a rural area with fewer buildings and less obstacles VHF is a better choice for communication needs.VHF is typically used in “line of site” applications where the transmission is traveling over greater distances with less physical obstructions. Users of VHF would be boats on the water or motorcycle riders who want to maintain contact on the road. Family Radio Service (FRS) — Family Radio Service is a frequency range that is set aside by the FCC for use in the consumer market for things such as baby monitors, cordless phones, and most commonly Two-Way-Radios. Use of these frequencies does not require a license, making it a very common range to use. FRS frequency waves do not travel well in populated areas and have difficulty penetrating walls and the like. General Mobile Radio Service (GMRS) — General Mobile Radio Service is a licensed radio service provided by the FCC. Operating between 462.550 MHz and 467.725 MHz, it is similar to FRS but operates on a higher frequency and generally used by businesses and professional users. To use a GMRS two-way-radio one must be licensed by the FCC or a direct family member of a license holder. Citizens Band Radio Service (CB) — The Citizens Band (CB) Service is in the 26.965 – 27.405 MHz spectrum range. The most common use of CB spectrum is short-distance, two-way communications using small, portable hand-held devices that function similar to walkie-talkies. Channel Spacing — The spacing between two adjacent radio channel frequencies. Narrowband — Brought on by a 2004 F.C.C. initiative, narrowbanding shrinks the frequency range of any given channel to allow more radio communication in the spectrum (e.g. VHF/UHF). The digital age has made shrinking the frequency range of channels a much more feasible task than it was with older analog radios. Voice Enunciation — A feature on BlackBox radio’s that allows the user to hear which channels they are switching between instead of having to look down at the radio or feel the notches. Programmable — The feature of a scanner to periodically check another channel or set of channels for a transmission, regardless of whether the scanner is un-muted on a transmission. Priority Scan — A feature on some scanners that will periodically check other channels for a transmission, regardless of whether it is unmuted on a transmission. IP 54 — IP stands for International Protection and indicates the degree of protection for an electronic device. There are different degrees of protection indicated by the two numbers. The first number indicates the degree of protection for contact and foreign body protection and the second number indicate protection against water. Basically, IP54 means that an electrical equipment (2 way radio in this case) can be used outdoor, covering safe environments protections such as dust or water splashes. Watt — A unit of power measured as one joule per second that is used to measure the rate of energy conversion or transfer. DPL (Digital Private Line) — Digital Private lines are used to filter out other radio user’s transmissions on the same frequency from being received. This is done by using a low inaudible, frequency tone that is transmitted along with a radio signal that allow the system users to ignore signals from other users. CTCSS (Continuous Tone-Coded Squelch System) — CTCSS is a circuit that is used to reduce the annoyance of listening to other users on a shared two-way radio communications channel. It is sometimes called tone squelch. Where more than one user group is on the same channel, CTCSS filters out other users if they are using a different CTCSS tone or no CTCSS. MHz — Short for Megahertz, it is used to measure wave frequencies and clock speeds of microprocessors. Scanning — The process of repeatedly tuning through a sequence of channels whether manually done by the user or automatically by the radio. Trunked — A radio system that allows multiple users to use the same set of frequencies in a small area. This is done by using computer controlled repeaters and pre-assigned talkgroup numbers. F.C.C. (Federal Communications Commission) — The Federal Communications Commission is a independent agency of the United States Government that regulates and controls all wired and radio communication within the nation. Omni Directional — A pattern of sound pickup that receives sound in all directions equally. Cardiod — A pickup pattern of a directional Mic that is in a shape similar to a heart. This type of microphone picks up much less sound arriving from a 90̊ angle or greater away from its front. Noise Canceling — A noise canceling microphone reduces ambient noise and makes speech more intelligible in voice transmission mode. Dynamic Mic — A style of microphone that uses a diaphragm that is mechanically attached to a coil operating in a magnetic field. Sound pressure variations cause the coil to move within the magnetic field causing the production of a voltage across the terminals. Carbon Mic — A type of microphone that uses a bundle of loose carbon grains that are attached to a diaphragm so that it compresses and decompresses the grains depending on the sound waves that come across it. The amount of electric current the grains will pass is based on how much they are squeezed, creating an analog version of the sound waves. Electret Mic — A type of condenser microphone whose transducer contains an electret material that permanently retains an electrical charge, and does not require the external voltage source required by other types of condenser transducers to polarize the diaphragm. Depending on your device it will follow the certain international standards on water and dust. The IP code is commonly used by business radios, and it contains a rating for resistance to both liquids and solids. With radios, solids typically refer to dust and other fine particles, but the IP code is designed to include larger objects. An IP rating has two digits, “IP54” for example. The first digit (5 in the previous example) refers to resistance to solids. The second digit (4 in the previous example) refers to resistance to liquids. Solids Resistance Levels (First Digit) The following is the numeric resistance level, and the types of solids that are resisted at that level. Liquids Resistance Levels (Second Digit) These are like the JIS standard (above). 1 – Dripping water (vertically falling drops) shall have no harmful effect. 2 – Vertically dripping water shall have no harmful effect when the enclosure is tilted at an angle up to 15 degrees from its normal position. 3 – Water falling as a spray at any angle up to 60 degrees from the vertical shall have no harmful effect. 4 – Water splashing against the enclosure from any direction shall have no harmful effect. 5 – Water projected by a nozzle (6.3mm) against enclosure from any direction shall have no harmful effects. 6 – Water projected in powerful jets (12.5mm nozzle) against the enclosure from any direction shall have no harmful effects. 7 – Ingress of water in harmful quantity shall not be possible when the enclosure is immersed in water under defined conditions of pressure and time (up to 1 m of submersion). 8 – The equipment is suitable for continuous immersion in water under conditions which shall be specified by the manufacturer. Normally, this will mean that the equipment is hermetically sealed. However, with certain types of equipment, it can mean that water can enter but only in such a manner that it produces no harmful effects.